Comets get blamed for everything. Pestilence in medieval Europe? Comets! Mass extinctions? Comets! Even the anomalous brightness variations in the Kepler star KIC 8462852 was blamed for a time on comets. 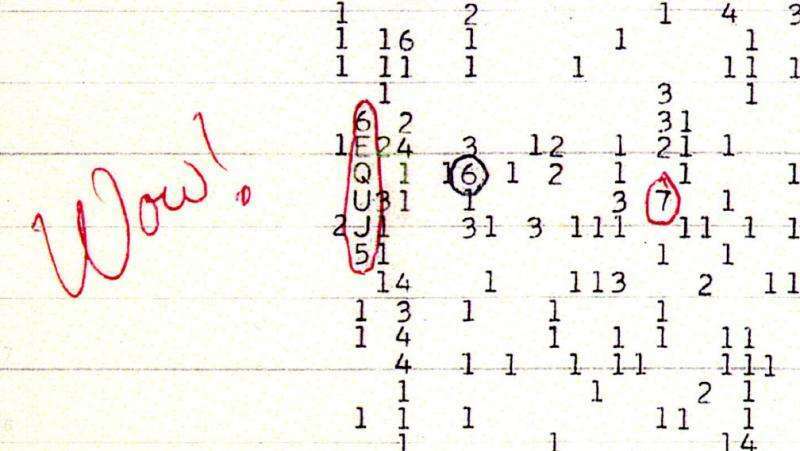 Now it looks like the most famous maybe-ET signal ever sifted from the sky, the so-called "Wow!" signal, may also be traced to comets. 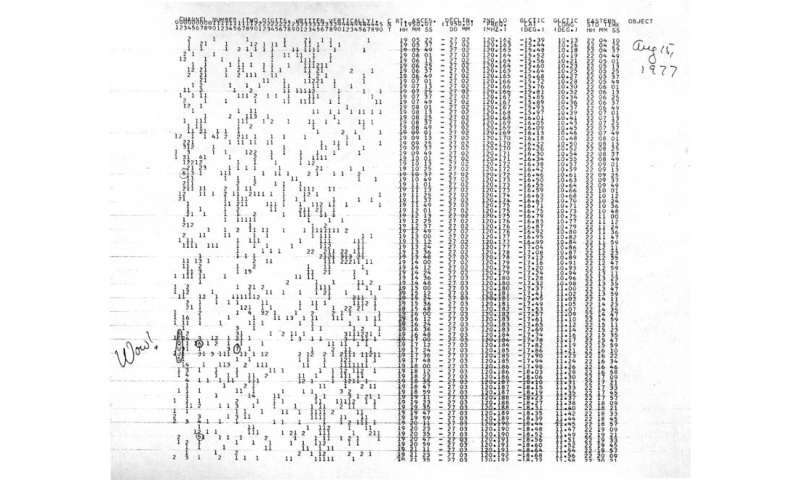 In August 1977, radio astronomer Jerry Ehman was looking through observation data from the Ohio State's now-defunct Big Ear radio telescope gathered a few days earlier on August 15. He was searching for signals that stood apart from the background noise that might be broadcast by an alien civilization. Since hydrogen is the most common element in the universe and emits energy at the specific frequency of 1420 megahertz (just above the TV and cellphone bands), aliens might adopt it as the "lingua franca" of the cosmos. Scientists here on Earth concentrated radio searches at and around that frequency looking for strong signals that mimicked hydrogen. 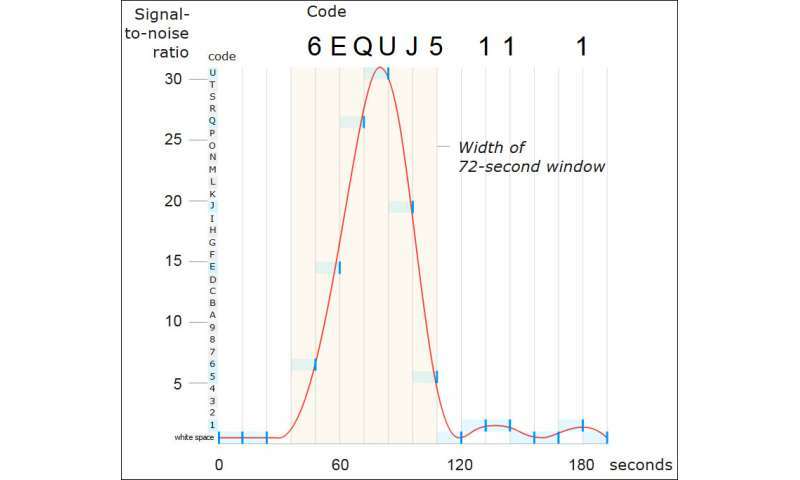 Ehman's searches turned up mostly background noise, but that mid-August night he spotted a surprise—a vertical column with the alphanumerical sequence "6EQUJ5″ that indicated a strong signal at hydrogen's frequency. Exactly as predicted. Big Ear picked up the signal from near the 5th magnitude star Chi-1 Sagittarii in eastern Sagittarius not far from the globular cluster M55. Astonished by the find, Ehman pulled out a red pen, circled the sequence and wrote a big "Wow!" in the margin. Ever since, it's been called the Wow! signal and considered one of the few signals from space that defies explanation. Before we look at how that may change, let's make sense of the code. Each digit on the chart corresponded to a signal intensity from 0 to 35. Anything over "9" was represented by a letter from A to Z. It was probably the "U" that knocked Ehman's socks off, since it indicated to a radio burst 30 times greater than the background noise of space. In Big Ear's 35 years of operation, it was the most intense, unexplainable signal ever recorded. What's more, it was narrowly focused and very close to hydrogen's special frequency. Big Ear listened for just 72 seconds before Earth's rotation carried the signal's location out of "view" of antenna. Since the radio array had two feed horns, the transmission was expected to appear three minutes apart in each of the horns, but only a single one ever picked it up. Despite follow-up observations by Ehman and others (more than 100 studies were made of the region) the signal was gone. Never heard from again. Nor has anything else like it ever been recorded anywhere else in the sky. Careful scrutiny eliminated earthbound possibilities such as aircraft or satellites. Nor would anyone have been transmitting at 1420 MHz since it was within a protected part of the radio spectrum used by astronomers and off-limits to regular broadcasters. The nature of the signal implied a point source somewhere beyond the Earth. But where? If it really was an attempt at alien contact, why try only once and for so short a time interval? Even Ehman doubted (and still doubts) an extraterrestrial intelligence origin, but a much more recent suggestion made by Prof. Antonio Paris of St. Petersburg College, Florida may offer an answer. Paris earlier worked as an analyst for the U.S. Department of Defense and returned to the "scene of the crime" looking for any likely suspects. After studying astronomical databases, he discovered that two faint comets, 266P/Christensen and 335P/Gibbs, discovered only within the past decade, had been plying the very area of the Wow! 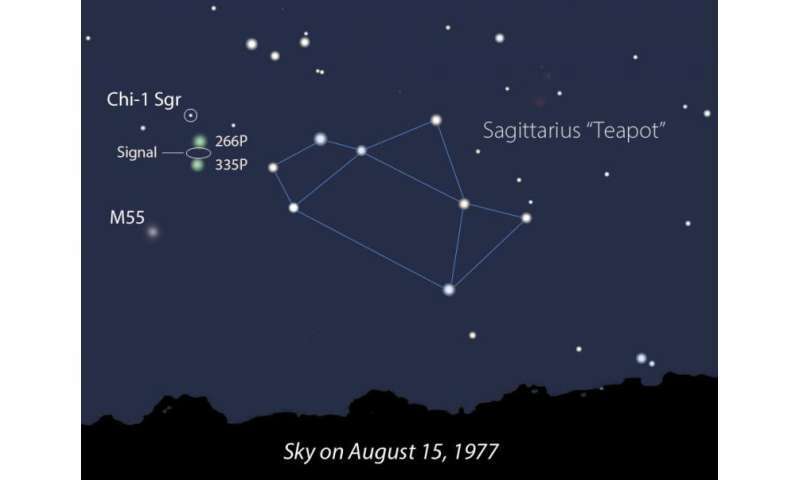 signal on August 15, 1977. If you recall, a comet has two or three basic parts: a fuzzy head or coma and one or two tails streaming off behind. Invisible to earthbound telescopes, but showing clearly in orbiting telescopes able to peer into ultraviolet light, the coma is further wrapped in a huge cloud of neutral hydrogen gas. As the Sun warms a comet's surface, water ice or H2O vaporizes from its nucleus. Energetic solar UV light breaks down those water molecules into H2 and O. The H2 forms a huge, distended halo that can expand to many times the size of the Sun. Paris published a paper earlier this year exploring the possibility that the hydrogen envelopes of either or both comets were responsible for the strong 1420 MHz signal snagged by Big Ear. On the surface, this makes sense, but not all astronomers agree. First off, if comets are so radio-bright in hydrogen light, why don't radio telescopes pick them up more often? They don't. 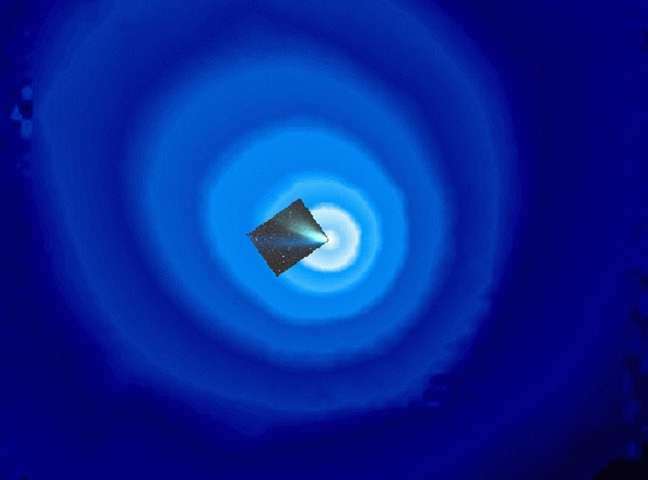 Second, some astronomers doubt that the signals from these comets would have been strong enough to be picked up by the array. A quick check on 266P and 335P at the time of the signal show them both around 5 a.u. from the sun (Jupiter's distance) and extremely faint at magnitudes 22 and 27 respectively. 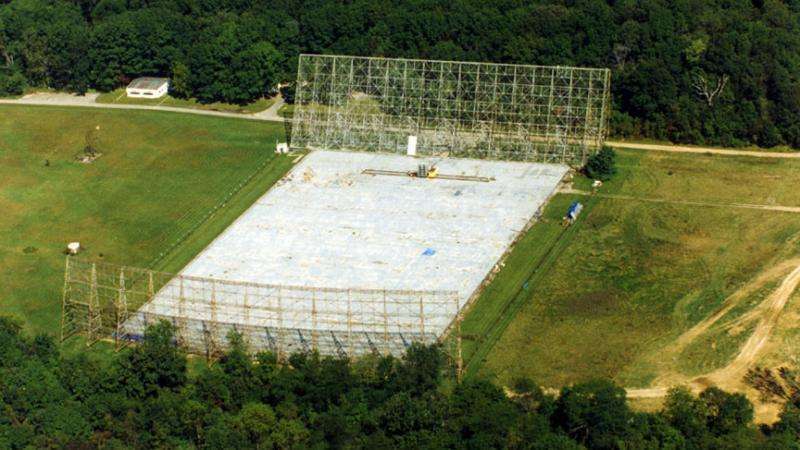 Were they even active enough at those distances to form clouds big enough for the antenna to detect? Paris knows there's only one way to find out. Comet 266P/Christensen will swing through the same area again on Jan. 25, 2017, while 335P/Gibbs follows suit on January 7, 2018. Unable to use an existing radio telescope (they're all booked up! ), he's begun a gofundme campaign to purchase and install a 3-meter radio telescope to track and analyze the spectra of these two comets. The goal is $20,000 and Paris is already well on his way there. It would be a little bit sad if the Wow! signal turned out to be a "just a comet", but the possibility of solving a 39-year-old mystery would ultimately be more satisfying, don't you think?